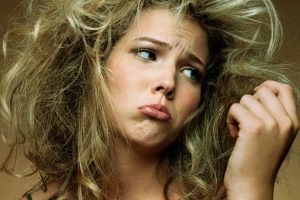 What Causes Dry Hair In The Winter? Along with the cold weather can come many hair issues. Whether it be frizz, split ends, static, oily locks, or dryness- you’re sure to be dealing with something. Unfortunately, the combination of cold air and low humidity make the perfect breeding ground for static electricity as well as dry hair. There’s nothing worse than showing to a party, and as you’re taking off your hat and coat, you notice some of your hair is sticking up in the air. The good thing is that there are ways to treat static hair. While preventing static hair, you could also be working to prevent and repair your dry hair. When you’re all bundled up, your best accessory becomes your hair. Therefore, making sure it doesn’t lose any of its pizzaz during the winter months is crucial for looking and feeling your best! If your hair is constantly being covered by a hat or a hood, it’s inevitably going to get dry and flaky, right? Wrong! Continue reading to learn more about how dry winter hair doesn’t have to be in your future. When the moisture levels in the air decrease, your hair often becomes brittle. 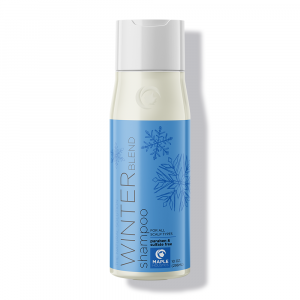 There could be many things that are causing your hair to be extra dry this winter in addition to the cold weather. Some things you might not have considered to be harmful are your hat and scarf! Even though they’re extremely necessary, the hat and scarf you’re wearing can be making your hair even drier than it has to be. Scarves and hats are usually made from fleece, wool, cotton, and linen. All of these fabrics absorb moisture- the moisture from your hair included. If these fabrics are constantly being rubbed on your locks, its bound to cause dryness. You should look for hats that are lined with silk or satin or you can wrap your hair in a satin scarf before putting on your cozy hat. Another culprit of your dry, itchy scalp could be the heat blasting in your home. Just like the central heating affects your skin, it affects your hair the same way. We tend to drink less in the winter because we are cold, not trying to cool down – and hot chocolate and coffee sound so much better. 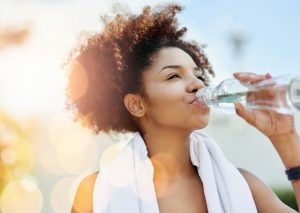 If you aren’t drinking enough water, you, and especially your hair, will suffer. Without enough water, your body won’t be able to function properly and provide your scalp with the necessary moisture. These are just a few of the causes of dry hair in the winter. Now you know the potential causes let’s move onto some solutions. Wrap your hair up in a hair mask. To repair the most damaged of hair, you may want to try a pre-treatment hair mask. Before you wash your hair, mix together milk, eggs, honey, and olive oil. The protein enriching qualities of all these ingredients make this the ideal answer to your dry-hair prayers. Apply the mixture to your head and let your hair soak it all in for half an hour. You may want to put a shower cap on since it could possibly be drippy and stinky. After 30 minutes, rinse with lukewarm water and wash your hair normally. Do this once a week to continue to reap maximum benefits. Staying hydrated nourishes your hair. You’ve heard the saying, “you are what you eat”, but have you heard that it also applies to your hair? Well, it does! Everything you put into your body affects your hair. Hair needs vitamins and minerals that are most commonly found in fruits and vegetables. The nutrients help your hair by promoting shine, increasing growth, and keeping it healthy and moisturized. Just because you’re eating foods that have high water content doesn’t mean you should skimp on drinking water. If you’re sick of water and looking for something a little sweeter, try to avoid sodas and instead reach for a fresh juice or smoothie. Make sure you eat right and hydrate to nourish your hair this winter. Think twice before you brush. Brushing your hair too often can be causing more harm to your hair than you could imagine. There is a myth that brushing your hair 100 times a day will keep it healthy, well don’t believe it and forget I even said it. It can cause your hair to be frizzy as well as thin out your strands – resulting in split ends. If you need to brush your hair, try to keep it to twice a day – at most. Brushing your hair once in the morning and once at night will let it have time to be left alone. Hair needs alone time just as much as you do. There’s a wrong way to do things and the right way the same applies to how you dry your hair. Waiting for your hair to completely dry before putting it up, can take what seems like a lifetime. Pulling your hair into a scrunchie while it’s still wet is a major no-no since it may cause split ends and breakage. You should also never rub your hair with a regular towel since the friction will cause your hair to break and get frizzy. It’s best to use a microfiber towel and if you must blowdry – do it on the cool setting. If you desperately need to use heat to treat your hair, make sure the blow dryer is at least 15 centimeters away from your hair to dry hair your hair right. 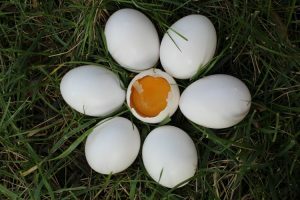 Raw eggs can help rescue dry hair. The protein found in raw eggs can be used as a natural moisturizer. Putting an egg in your hair is a natural remedy that has been used for generations. It’s been around for so long because it clearly works to strengthen and prevent breakage of your locks. It’s simple. Whisk up a raw egg and massage it into your hair and scalp. After 20 minutes you can rinse it out with cold water. Be sure not to use warm water, since it will cook the egg, leaving chunks in your hair. It’s best not to do this more than once a month since it could dry out your tresses if over-done. Make sure your shower isn’t too hot. As it gets colder outside, it’s extremely tempting to take warmer showers. The truth is that hot water, unfortunately, dehydrates your hair as well as your skin- especially in the drier air. Soaking in a hot bath is like steaming the moisture out of your skin – stripping it of its natural oils. Adding oatmeal, milk, or even honey to a warm bath, however, can help seal in your skin’s moisture. To prevent yourself from taking warmer showers and baths, keep the water heater at the same position all year round. It would even be better if you push it down a little during the fall and winter months. Avocado’s have a multitude of skin and hair benefits. Avocados are dense in nutrients that don’t only benefit your physical health and well being but are also great for your hair. They have a unique combination of fatty acids that are able to help strengthen the hair without weighing it down. 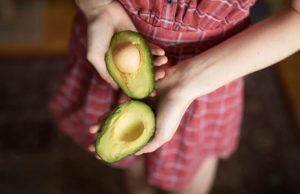 Since avocados have intense moisturizing properties, the oil can help prevent split ends and hair follicles from breaking. After you get a trim, use avocado oil on the ends of your hair to prevent the usually-inevitable split ends. Avocado oil can also help with your dandruff problems. When applied to the scalp, it rejuvenates and moisturizes. If you’re trying to grow out long healthy locks but seem to be struggling with split ends, your pillowcase may be to blame. Just like a towel can be damaging, so too your pillowcase. Sleeping on a classic cotton pillowcase is most probably causing unwanted breakage. Switch to a satin pillowcase or wear a satin bonnet to help prevent frizzy and dry hair. You can buy a winter hat that’s lined with satin since the wool is most likely damaging your hair as well. Making the switch to sleep in satin will make your hair look fresh throughout the week. 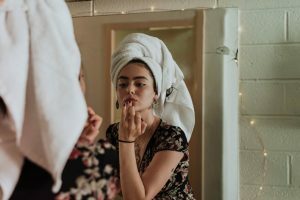 Honey is able to draw moisture to your hair and keep it there because it’s a natural humectant – which is basically just a fancy name for a substance that keeps things moist. 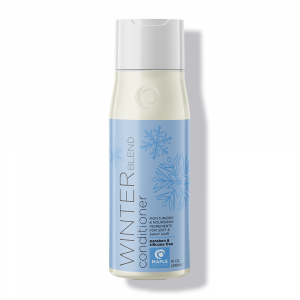 Sealing in moisture is crucial for your locks in the winter. It also helps reduce breakage, which will help you achieve your long hair goals. Honey is full of antioxidants that help to keep your scalp and hair healthy by preventing damage. Not only does it prevent damage, but it also fills your hair with shine and luster. It conditions and rejuvenates your tresses from within, leaving you with beautifully strong “shampoo commercial” hair. An all-natural shampoo to revive your hair. 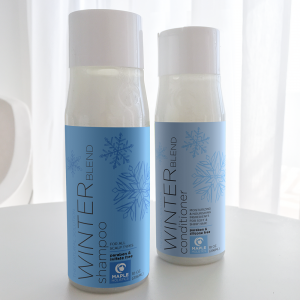 In the winter, your hair needs all the moisture it can get, making shampoo and conditioner a vital part of your hair regime. It’s ideal to end every hair wash with conditioner. 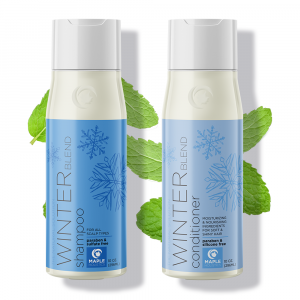 Maple Holistics’ Winter Blend Shampoo and Conditioner work by hydrating and moisturizing your scalp, which helps eliminate dandruff and itchiness. Once all the shampoo is rinsed out, start applying the conditioner from the middle of your hair all the way down to the ends. You should generally spend a little more time on your ends since they are the oldest and most damaged. Wait a few moments before rinsing it out with cool water to close the hair follicle and seal in the moisture. When it comes to the winter months, the first thing that usually dries out is our skin, which is why we tend to ignore our luscious locks. 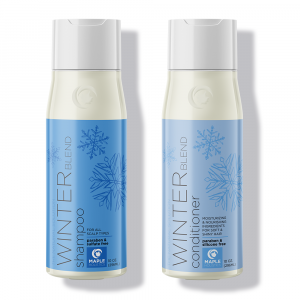 However, the cold weather will affect your hair’s moisture whether you usually suffer from dry hair or not. Winter can be fun and stress-free, we just have to make the right choices for our mind, body, hair, and soul. 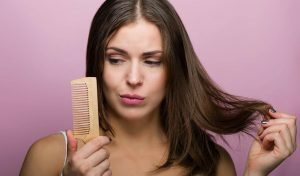 The first step in treating your dry hair is figuring out what’s causing it and once you’ve done that, you’re basically halfway to smooth, hydrated tresses. 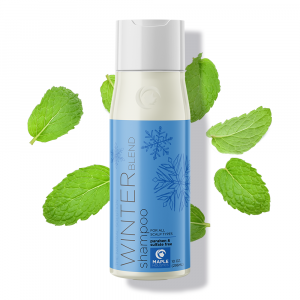 Whether it’s buying a new pillowcase, putting some egg in your hair, or cutting down on hot showers, you’ll be well on your all-natural way to battling your hair’s winter blues. With these tips, you’re sure to be turning heads at the next holiday party. The sooner you start working these natural winter-hair hacks into your routine, the sooner your hair will thank you. Using natural products is the safest and healthiest way to achieve your dreamy hair goals. By sticking to all-natural remedies you solve your hair and skin problems from their root, rather than just covering up the symptoms. This means that your tresses are nourished from the inside out. Your luscious locks may never even notice winter has arrived. When it comes to hair health, a little extra effort can go a long way.